Remember the love and passion, that sweet honeymoon period during the beginnings of your relationship? We have just the place that is guaranteed to bring you back to how it all began. 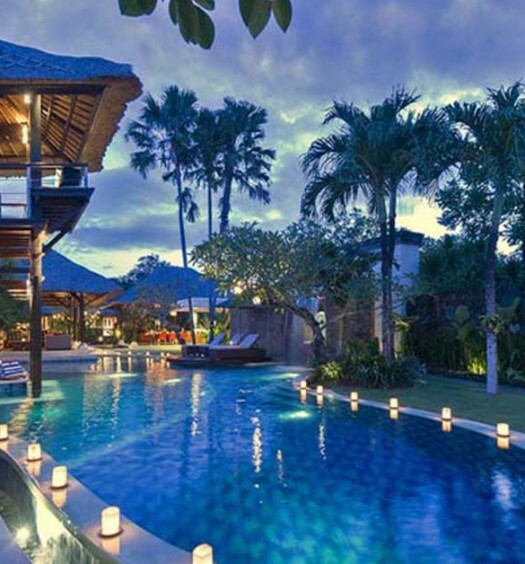 Introducing AYANA Resort and Spa BALI – top on the list of our favourite romantic vacation destinations. 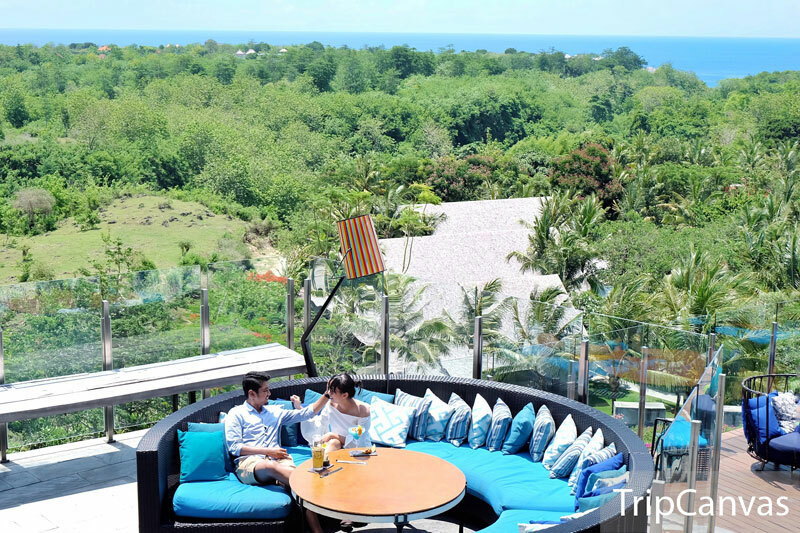 AYANA houses 3 different resorts – The Villas at AYANA Resort (which received the 2017 Forbes 5-star award), AYANA Resort and Spa BALI, and RIMBA Jimbaran BALI by AYANA – within a sprawling 90-hectare compound. 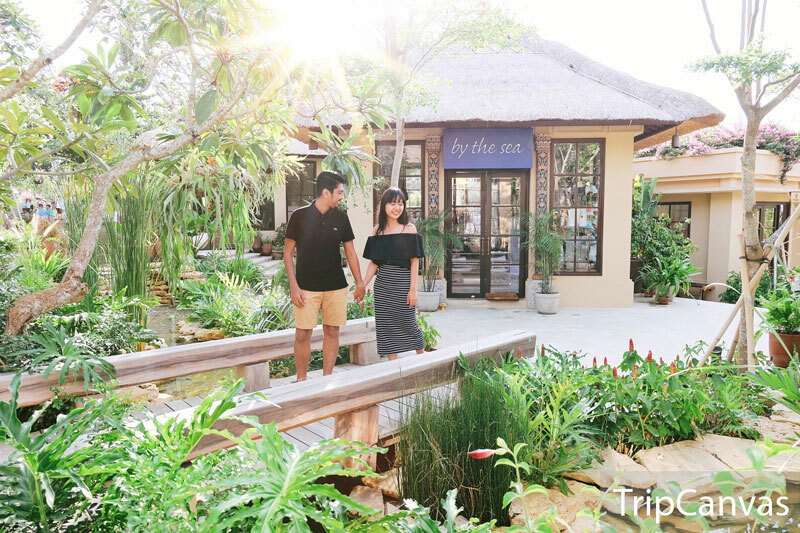 Couples, here’s the catch – this integrated resort has everything you need, you don’t even need to leave the resort grounds! You can get everything within the comforts of AYANA’s premises, so you can spend quality (and quantity) time you want with your significant other! 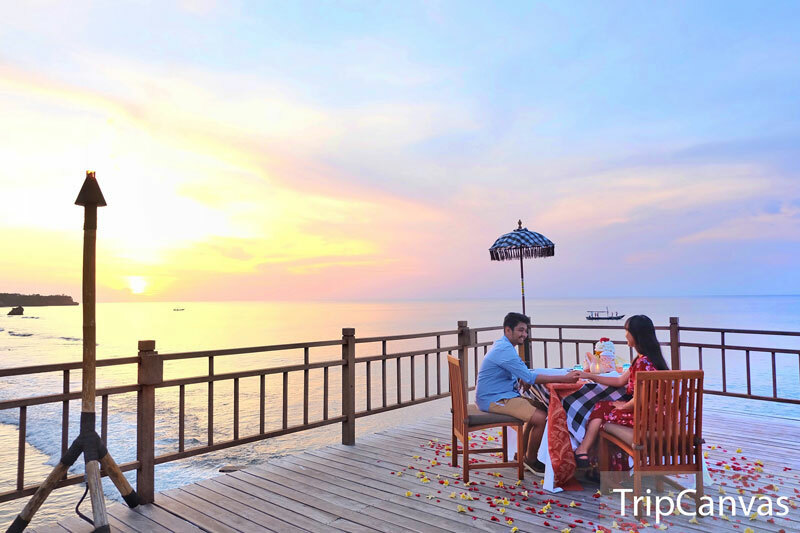 Your romantic memories will be nothing short of perfect – exactly like how your honeymoon had been, or perhaps even better. And the great thing? If you’re here with the kids, the most romantic vacation is guaranteed – with fun children facilities to keep them occupied while you’re spending some much needed time alone together. After the hustle and bustle of everyday life, why not set time aside to reconnect and romance each other – with these 11 amazing reasons to fall in love, all over again. It was tough, but we did it! We’ve found 2 of the best pools out of all 12 pools available at AYANA. The first pool that dazzles with its ingenious ocean-merging design is AYANA’s Ocean Beach Pool. Located just above Kisik Beach, it provides a breathtaking spot for swimming, lounging, and soaking up the sun. Choose your sun-lounger on the pool deck or the natural sand terrace, put on sun lotion, whip out a book and enjoy a marvelous pool day. 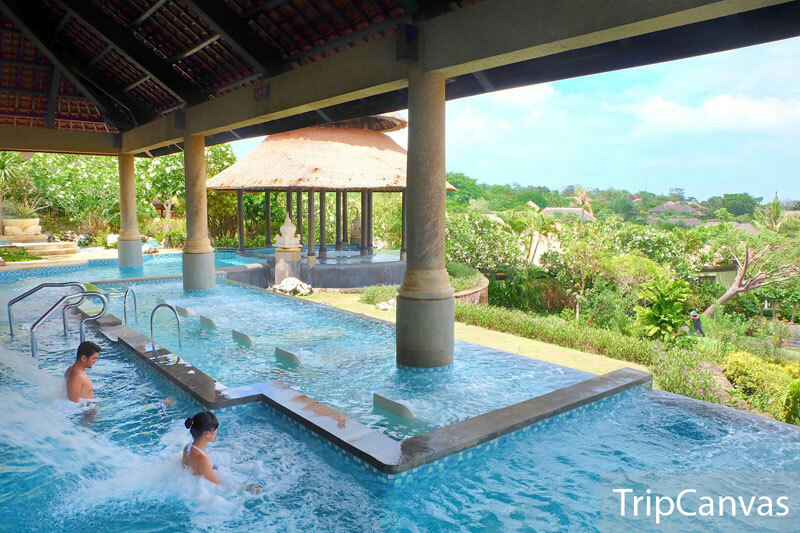 After a refreshing swim in this saltwater pool, make sure to ask the helpful staff to help you snap a photo or two. The Ocean Beach Pool provides an enchanting photo-taking opportunity you won’t want to miss! The pool seamlessly blends into the ocean, and you’ll be able to capture some of the nicest ocean horizon photos here. Tip: If you’d like some quality private time in your personal mermaidia, come in the morning at 7am for a quick dip and you’ll have the pool all to yourselves! 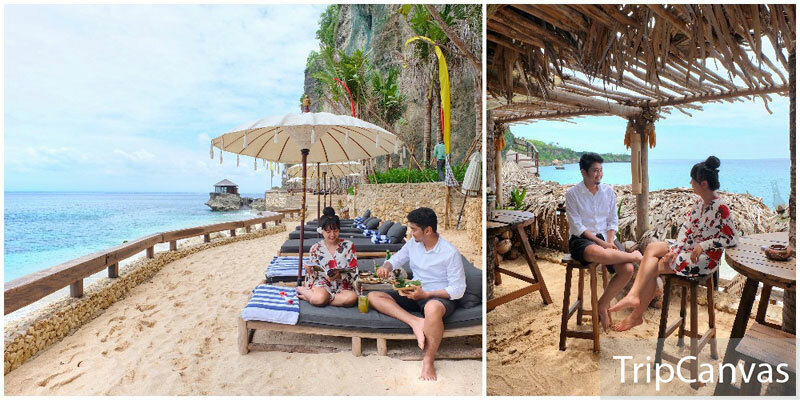 With poise and charm, Kubu Beach Club sits on a beautiful stretch of sand with terrific views of the ocean, and to the soothing sounds of the washing waves. 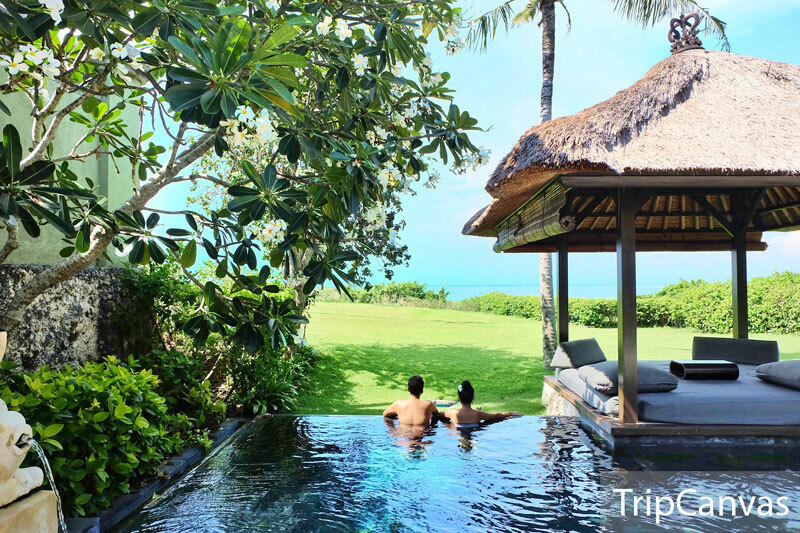 It also guarantees the whole sand-in-your-manicured-toes experience by keeping it super laidback with its traditional Balinese interior – simple and rustic. Beach babes will love this spot as traditional Balinese massages are offered by the shore while you unwind under a coconut tree. Temporary tattoos and hair braiding are also available. Some real tiki-chic vibes! Feeling a little peckish? 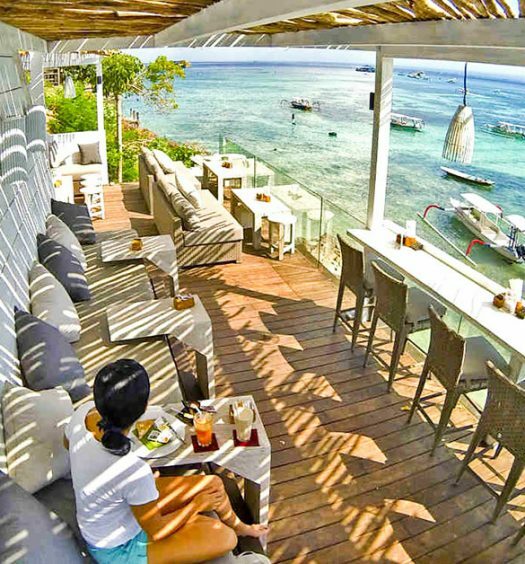 The food, like the ambience, is barefoot-elegant; the international menu at Kubu serves more than just crisps (think cheeseburgers and meatball soups). For those who do not fancy the 197 steps that lead to the beach club, feel like a Kardashian and make use of the inclinator at AYANA. Otherwise, piggyback ride on your partner it is! The unobstructed view at the beach of the forever changing pink-to-red-to-orange sky bordering the azure horizon will have you seriously considering the spot for your couple retirement plans! 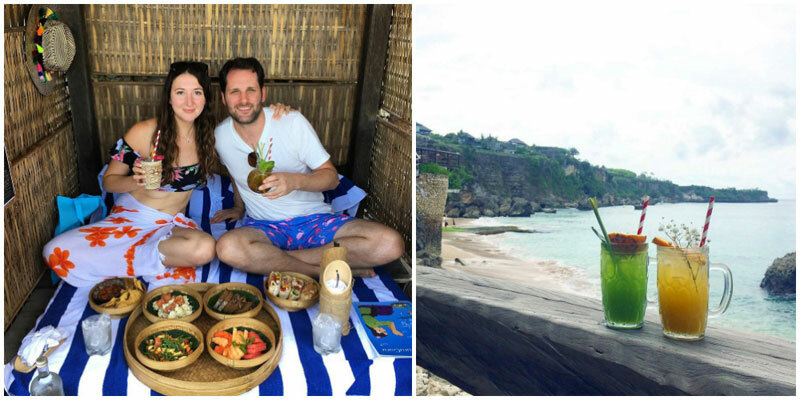 Do note that Kubu Beach and Kubu Beach Club are only open for in-house guests of AYANA Bali. Taking designer pools to a whole new level, The Villas’ River Pool is another great spot to just lounge and laze the day away. Boasting a truly unique design, this beautiful two tiered pool offers turquoise waters surrounded by gorgeous greenery. The double chaise lounges along the side of the pool also offer a lovely spot for cuddles and canoodling with your darling as you reminisce away – or simply enjoy a lovely day out by the pool. Perched above the ocean on natural rock formations is a unique dreamy spa experience waiting for you. It will take you 115 steps to reach the pavilions of the Spa On The Rocks, but it’s totally worth it. Like the light at the end of the tunnel, you will be rewarded by a pampering session of a lifetime. With the sounds of waves crashing against the rocks as you indulge in your treatment, you are just one window away from the very essence of fluidity and calmness. The experience is sure to awaken all your senses with its soothing backdrop, dramatic views, and the blend of relaxing essential oils in the air. Renounce your very last sign of stress as you indulge in the spa’s renowned signature treatments. Try their recommended Dazzling Pearl treatment, which includes a luxurious Wild Harvested Pearl body scrub and massage oils bound with Mother-of-Pearl elements! Alternatively, simply opt for a romantic ritual designed for couples. Lure your body into a treatment sequence that will rejuvenate you and your darling from head to toe, by utilizing the earth’s most exquisite gems such as diamonds, silk and pearls. This dream experience named Diamond Miracle is the perfect pick for couples to reconnect through an exotic signature pampering. 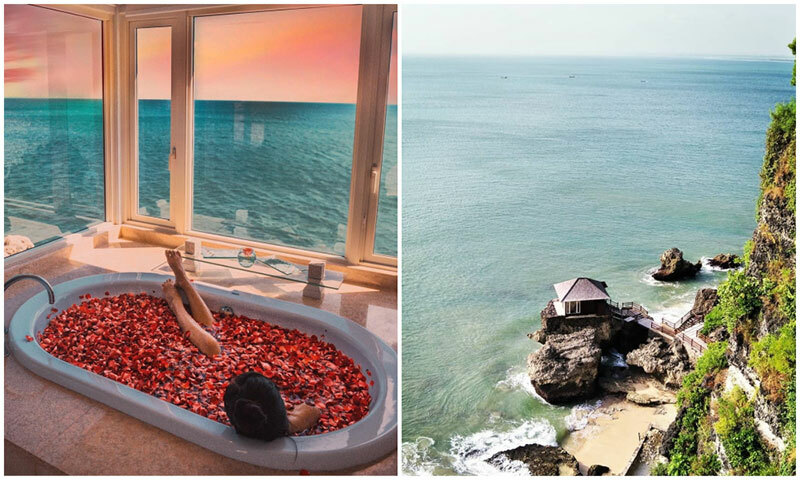 Start the day with a massage and end it with a bottle of champagne while the both of you soak in a bath decorated with 500 red rose petals. Definitely something that wins over typical scotch on the rocks! 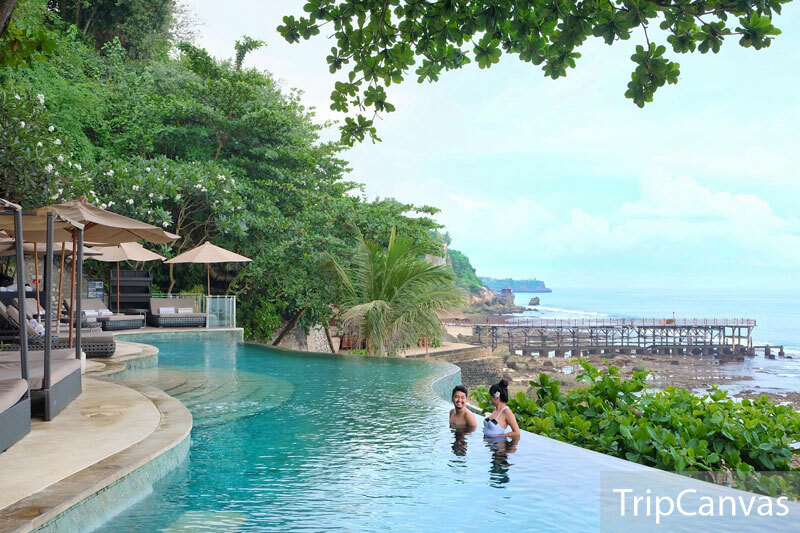 Perched on the edge of the cliff with amazing views of the ocean, the Ocean Front Pool Villa is your private love nest – with a fun array of exclusive villa activities available. The first and best thing to know? You’ll get to enjoy a flower bath soak upon arrival, specially for all guests at The Villas! Next, there’s your very own private pool where a floataway champagne brunch is served in the pool. This Villas’ exclusive takes romantic getaways to the next level. Lounge, laze and chat the afternoon away with a delicious meal prepared by in-house chefs. With attentive staff waiting at your call, everything you need is at your fingertips. Remember to bring cute swimming attire, and have a delightful afternoon snuggling poolside! 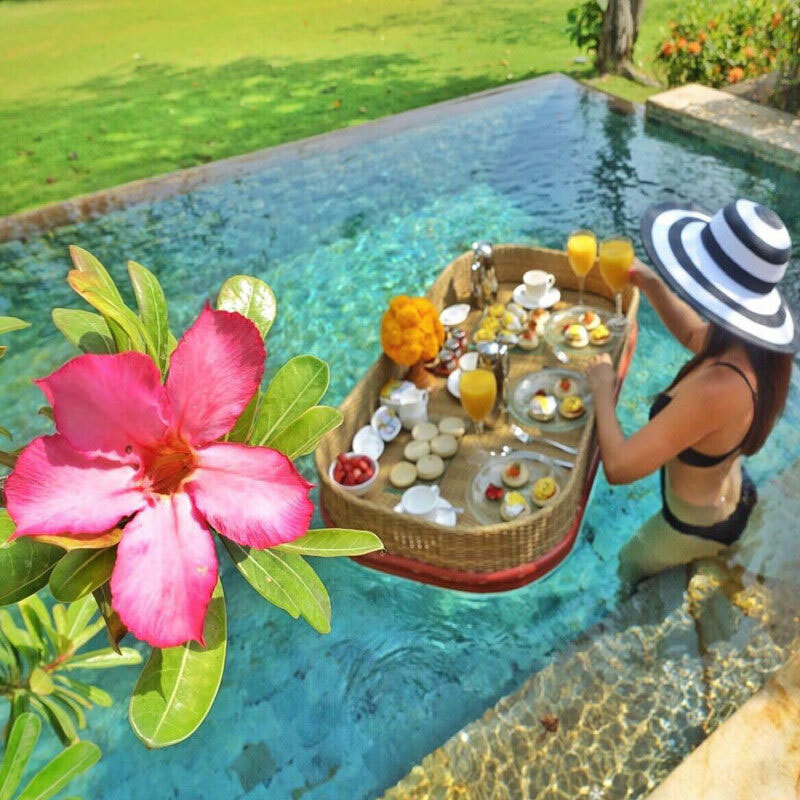 There’s also in-villa dining (see romantic dining below); and in-villa pampering where professional therapists from Thermes Marins Bali Spa come, and spoil you in your personal haven. 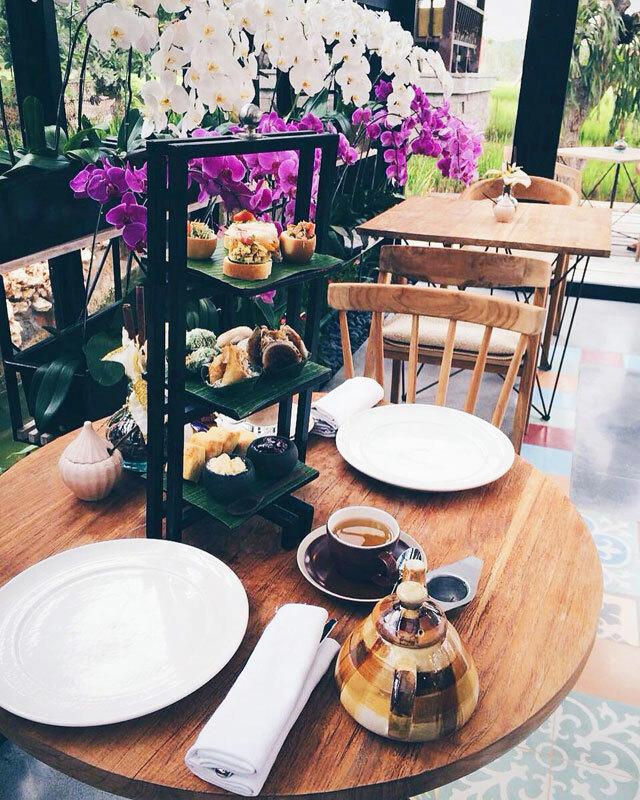 Don your finest afternoon dress, sweet lipstick and dust off your pearl necklace – it’s time to head over to AYANA’s Orchid Tea Lounge with your sweetheart, where you can indulge in savoury treats and sip on traditional teas, while nature serves as a backdrop. This charming tea house is actually a greenhouse beautified with orchids and guarded on the outside by a splendid patch of vibrant lawn – isn’t it simply classy? Their mouth-watering selection of sweet and savoury treats includes tarts, sandwiches, chocolate cakes and it is served to your table on tiered stands while you get to choose from exotic flavoured teas, fresh pressed juices, refreshing ice tea or coffee. Orchid Tea Lounge also features a retail corner so you can grab some unique souvenirs for your friends and relatives – how about a traditional tea set with tea leaves? We’re sure your tea-loving friends would appreciate it! Planning for your wedding? It is an exceptional venue for a wedding reception, and it comes with orchids so you don’t really need to spend much time on decorations. A back-to-nature afternoon tea time is waiting for you! 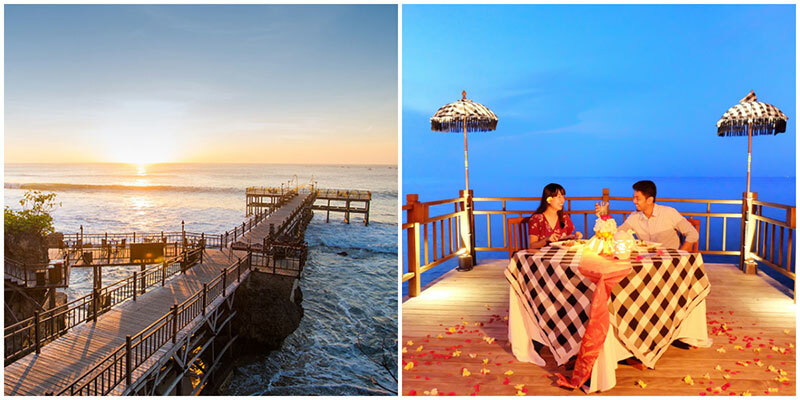 Voted the most romantic dining venue in Bali, the breathtaking views of AYANA’s private jetty will make all your romantic dreams come true. This wooden jetty stretches 30 meters out to sea and at the end of the pier, your table awaits with soft music from bamboo xylophones accompanying the sound of the ocean. 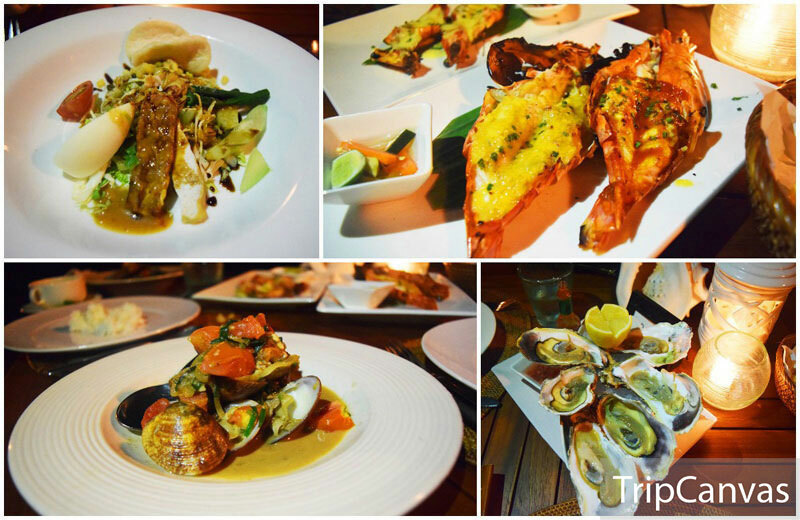 Simply get seated and wait for your beautiful 4-course dinner (that includes 3 exquisite lobster dishes) to be served, and dig in! 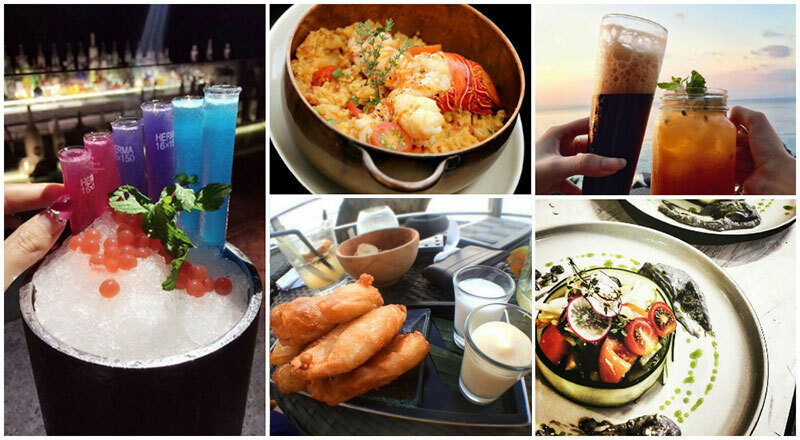 1 out of 19 restaurants and bars available, dining at Kisik Bar & Grill, truly is an experience we will never forget. 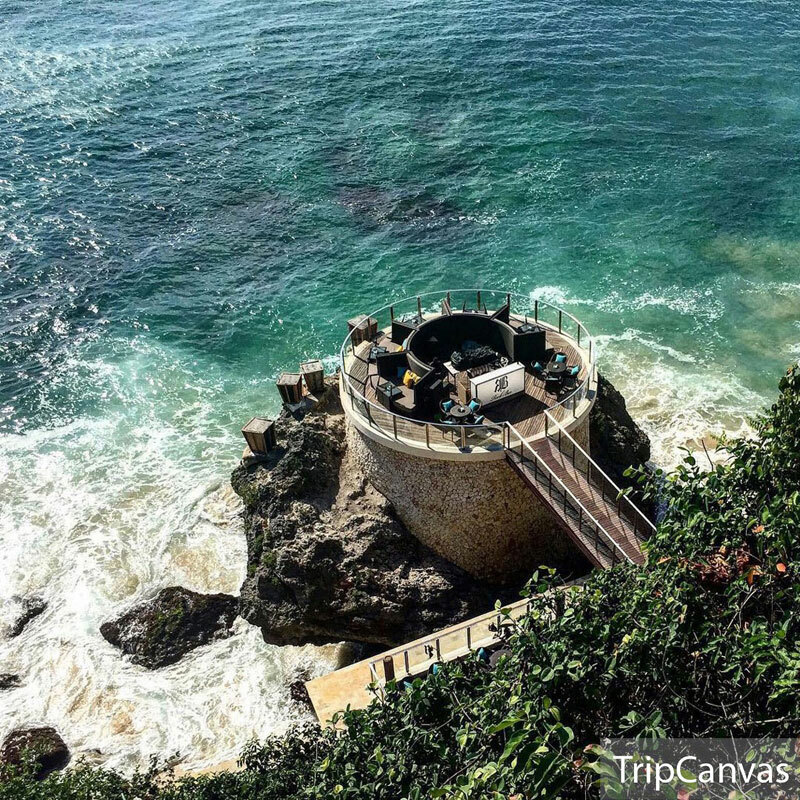 Imagine cliffside seating above the ocean, with waves crashing on the rocks below – and the soothing sound of the waves, paired with the magical shimmering ocean at night. Before you get seated, head to the center of Kisik and select your favourite seafood. Providing catch fresh off the boats – huge creamy oysters, jumbo prawns, lobsters and more are available for your pickings. Grilled with your choice of accompaniments (garlic butter, lemon butter, Balinese BBQ sauce and more), food is cooked to perfection and served with a basket of steaming rice. All that’s left to do? 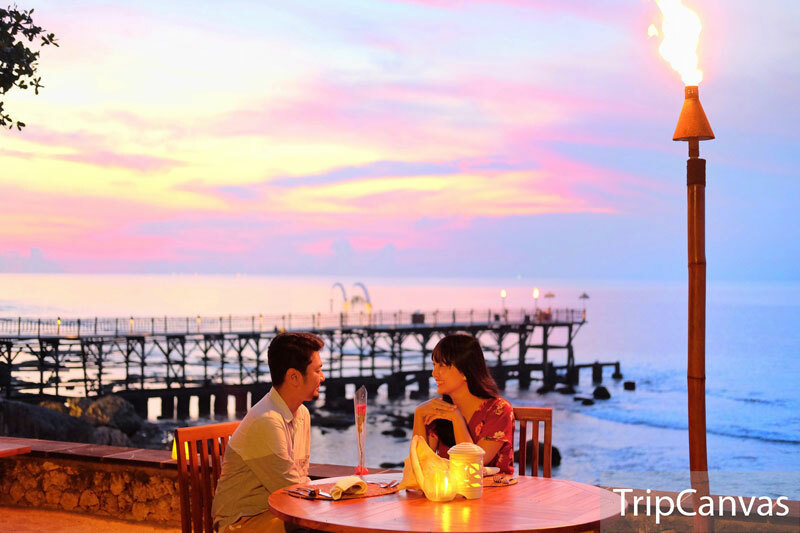 Tuck into delight as you curl your toes in the sand, and enjoy the scenic view, food, and an incredibly romantic dinner with the love of your life. The main pool at AYANA hosts a real battle of ultra-blues with its infinity edge. Not only does it offer unobstructed ocean views, but it completely merges with it. We already think AYANA is one of Bali’s most swoon-worthy locations, so now imagine the romance of its vanishing-horizon pool. Glide your way through till the edge of the pool while you pretend to fall off to the ocean. You recall that spectacular Instagram picture of someone walking along the edge of an infinity pool as though walking on water? Time to get one of your own! And if you’re looking for a couple picture, the staff will be glad to help! Pair this perfect day by the pool with a refreshing cocktail under the tropics and grab some snacks so you can just unwind all day until it’s time to witness the epic sunset! 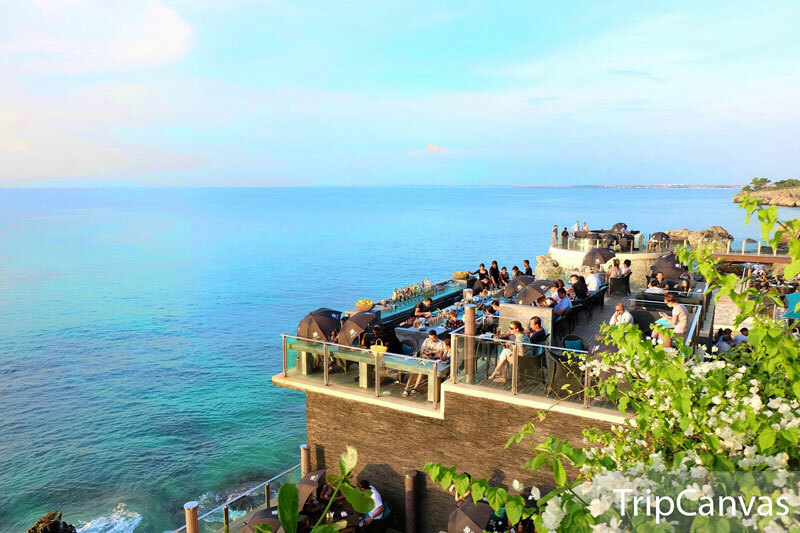 One of Bali’s most iconic sunset bar venues (and one of the best bars in the world according to Forbes Travel, CNN and more), Rock Bar at AYANA is a wonderful place for after-dark drinks. 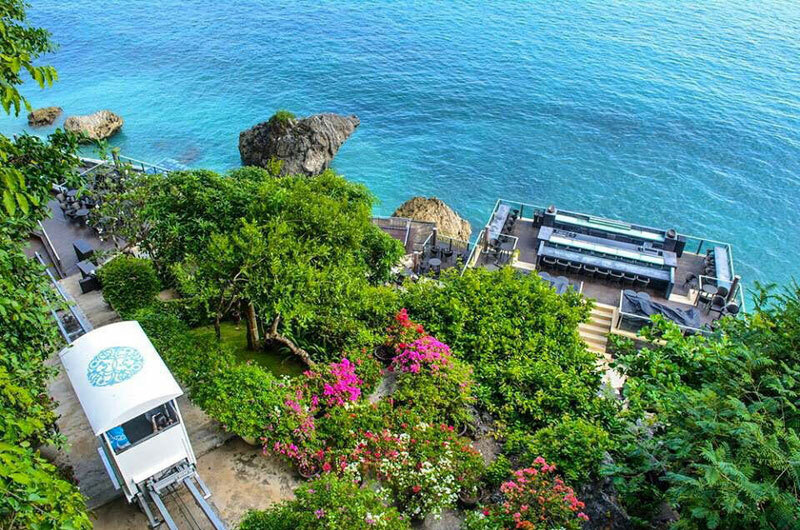 Situated on the rocks, take the inclinator down the cliffs to get to the bar and start ordering signature drinks like AYANA Passion, Spa on the Rock, and more. For small bites, we ordered pisang goreng and LOVED it. The crisp of the fried banana fritters, paired with a coconut cream dip? Heaven. With chill vibes, good music, and a view of waves crashing on the rocks against the illuminating sunset – Rock Bar is both a sensual and intimate place for couples to reconnect. Do note that a dress code applies (no singlet, boardshorts, or alcohol-branded attire). It’s a good reason to dress up and remind each other just how lucky you are to have each other. Want to show off your great night? Complimentary WIFI is available at Rock Bar for uploading the magical moments of the night! 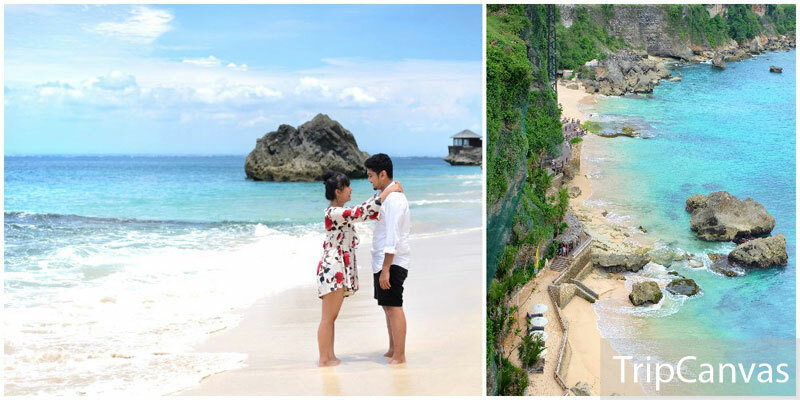 It doesn’t really matter if you are a fresh new couple or a soon-to-be-married; a photoshoot session with your loved one is an inspiring idea that makes the best memories..
Here’s a cheat sheet of the best spots to get some awe-inspiring couple photos done at AYANA. We hope these inspire you to get creative shots! There’s something inherently romantic about chapels that calls for the purest couple photos. 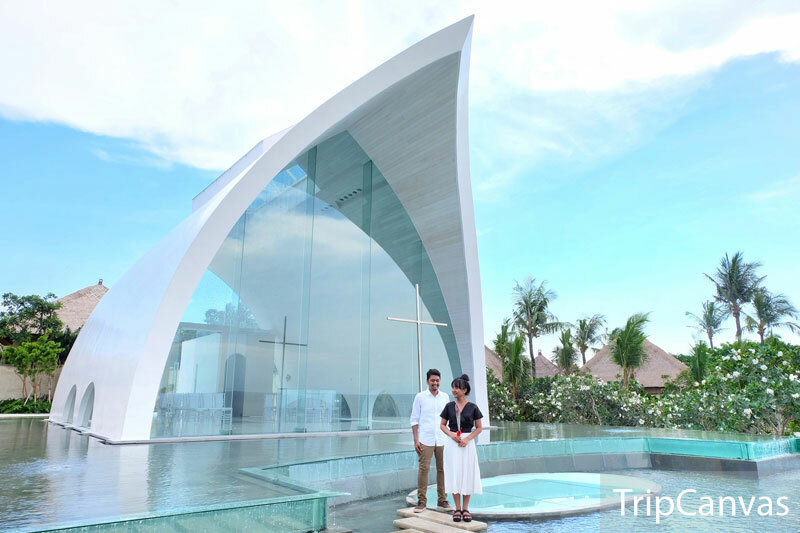 Overlooking the Indian Ocean, Tresna Chapel has witnessed many couples exchanging their vows. 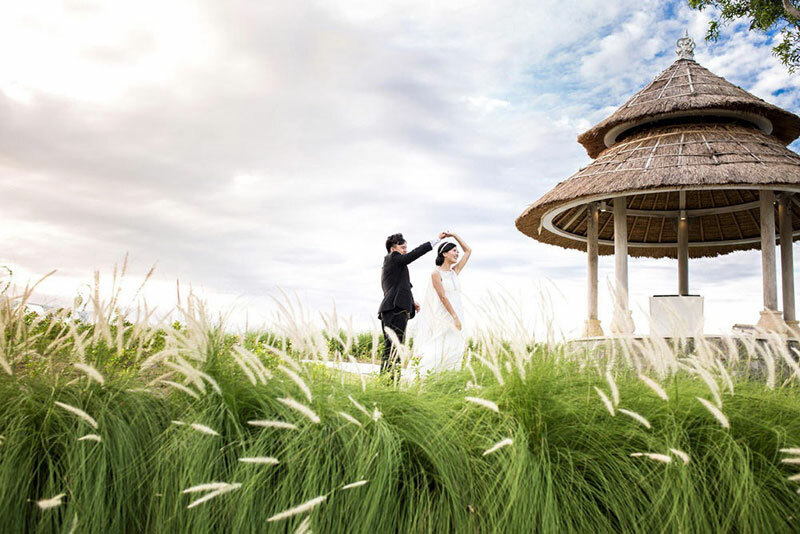 And of course, it is also a magical and oh-so dreamy location for a simple photoshoot session with your life partner. We’ll let the pictures speak for themselves. The most enchanting shots are guaranteed at golden hours. 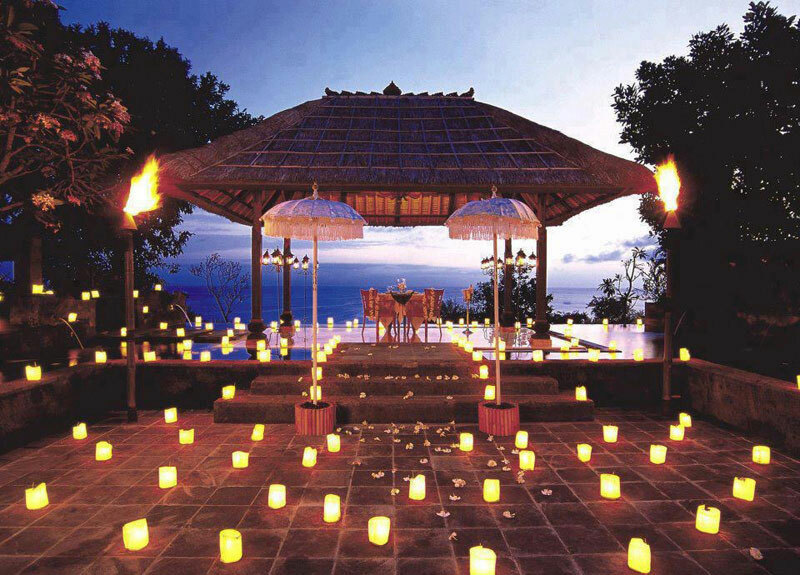 In a dreamy field of lallang, step into a traditional Balinese gazebo with your sweetheart. Here’s to endless heart-to-heart conversations, a quiet time spent reading together and a lovely afternoon tea. The sunlight will complement your amazing photos while the gentle breeze runs through your hair. You can also get a little creative by decorating the gazebo with some exuberant blossoms – why not add a floral touch to your memories? What’s a wedding without a unique and scenic photoshoot location nowadays? 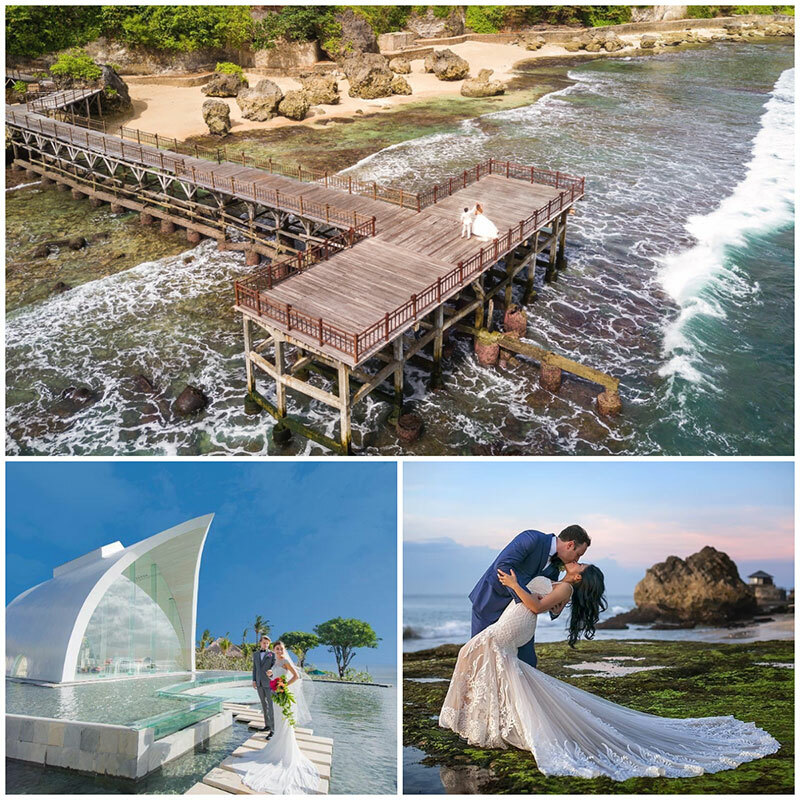 Weddings at AYANA take place in scenic venues from a chapel to ballrooms, romantic restaurants, private jetty, gazebos and pavilions strewn with your favorite flower petals. And these locations also serve as perfect spots for pictures. Even strolling around AYANA itself will promise amazing shots! 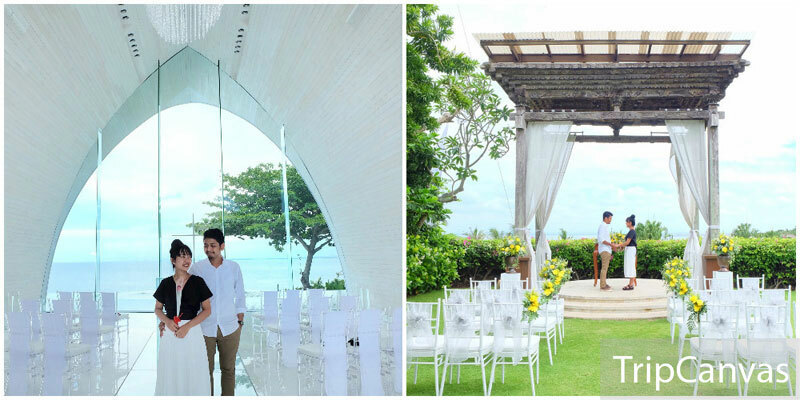 Here’s where your childhood dream of tying the knot in a dreamy setting becomes reality. Yes, you can even have your own Cinderella’s carriage with a white horse (and of course your Prince Charming)! With a poolside dining area decorated with plush oversized daybeds for maximum comfort, and a second floor mezzanine with rustic timber tables and lounges – choose your favourite spot and settle right in. 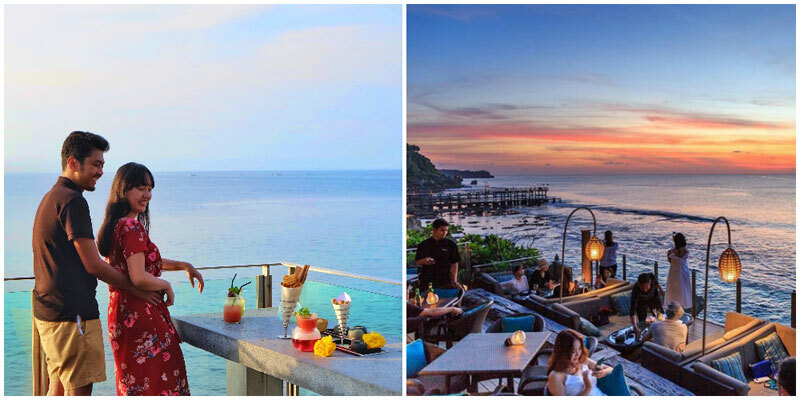 Set on the rooftop of RIMBA, UNIQUE is a great place to wine and dine to a refreshing seabreeze, and 360º panoramic views of Uluwatu Hills. UNIQUE also recently added mouthwatering Mexican cuisine to the repertoire of food available here – don’t miss their Mexican Sunday Brunch! Scrumptious shrimp taquitos with chili salsa, churros, and fresh fruit margaritas? It’s the many little pleasures like these that make AYANA an amazing place to stay – and UNIQUE definitely is one of them! Opening Hours: 11am to 12am (Monday to Friday), 11am to 1am (Saturday and Sunday). Mexican Sunday Brunch every Sunday 11am to 3pm. Margarita Time every Sunday 11am to 6pm with half-priced margaritas! Located high up with a good view of the ocean and resort grounds below, this therapeutic pool provides a truly unique environment for bonding and relaxing with your loved one. Great for relieving stress and relaxation, make your way through 12 hydromassage stations in this aquatic massage pool and be prepared for a surprisingly fun time. 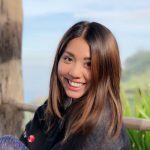 While it may be a little tiring at first, fighting against the current (especially if you, like us, have not worked out in a long time) – trust us, it gets better! This seawater therapy is great for combatting jetlag and poor circulation, and when you’ve made your way to the last station – from head to toe, you’ll be fully relaxed! The last station also makes a good place to settle into great conversations as you enjoy the view. If you’re looking for maximum privacy and seclusion, head to the Cabana Pool. Simply walking past made us feel like sneaking in, just to get the most relaxed afternoon nap. With 8 trendy cabanas decorated with eclectic furnishings from lounge chairs to beanbags and hammocks – choose your cabana and settle right in. After a round of swimming in the pool, come back to your cabana, draw the thick curtains, and spend quality time bonding with your partner. You may also order food and have a private picnic in the stylish space too! And if you’re looking for private lounge areas with a little more space, head over to the other side of the pool where 5 spacious cage-like gazebo sit. Taking oversized daybeds to the extreme, these private not-so-little nooks can comfortably seat not just a couple, but a family too, if you’ve brought the kids. 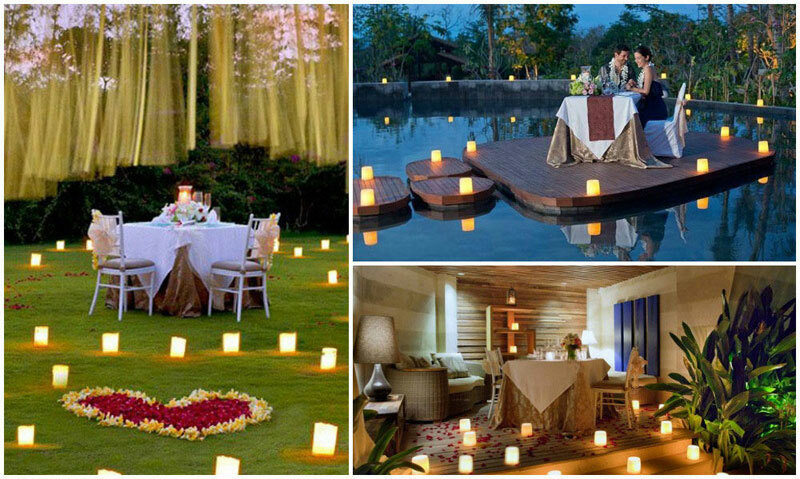 How about experiencing a Candle Light Romantic Dinner, AYANA style? Luxurious romance doesn’t get any better with a glorious table surrounded by the glow of candlelight and flower petals. Set in the most intimate of settings, in a beautifully lit pavilion hidden away from the bustling areas. You may even choose where to have your romantic dinner. In a private garden pavilion, or the cliff-edge gazebo in AYANA’s luxury villa. Once the table has been set, you’ll be welcomed with flower garlands and Due Accoustic will be there to provide live entertainment – just for you, as you enjoy a delectable 4-course dinner. 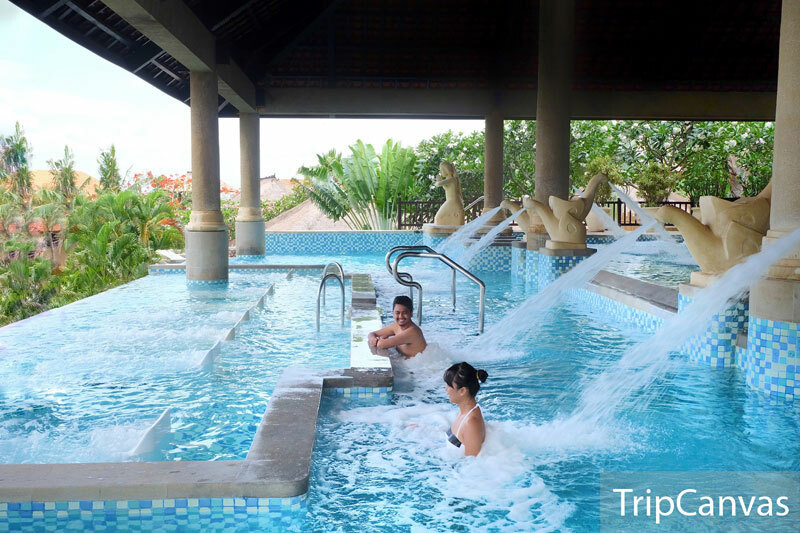 For the parents with kids seeking a romantic vacation, and you’re unable to leave the kids back home – AYANA Resort and Spa allows you to have the romantic vacation you want, even with the kids along. Kids clubs are available in both AYANA and RIMBA with staff taking care of your kids as you take some couple time to reconnect. 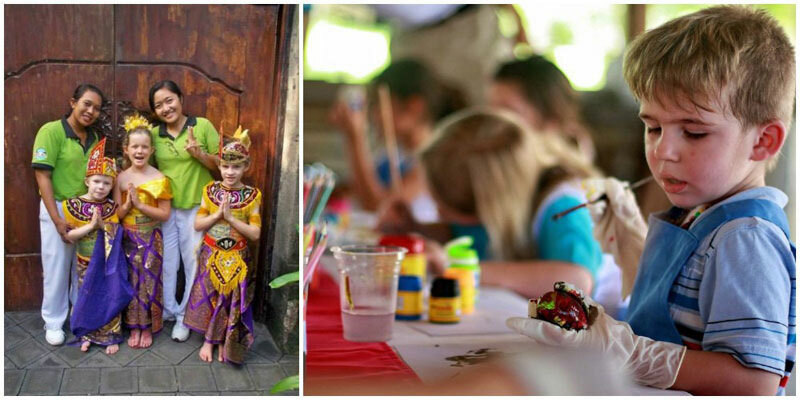 With kids’ activities at the kids’ clubs – such as Balinese Dress Up, Art with Shells, Clay Painting, Pancake Decorating and more, your kids are sure to be satisfied and free to unleash their creativity. 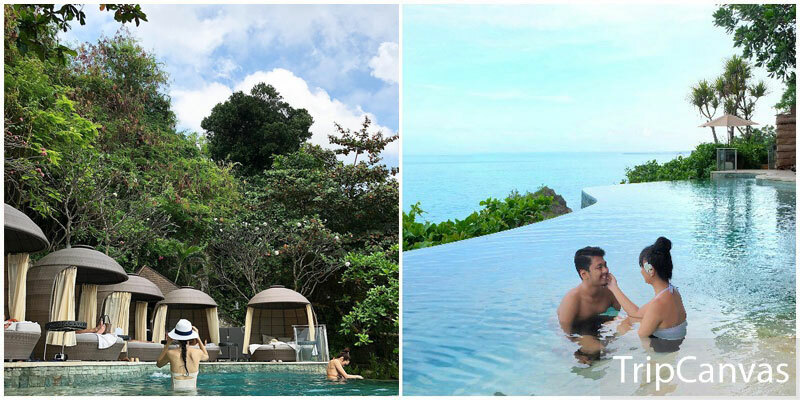 Also, there are many activities parents can do with the kids at AYANA – tree planting, Canang and Ketupat Making, or swimming at the 11 pools available, and more. If you’d like to bring them outside of AYANA for a quick adventure, bring them to Jimbaran Village for a fish market tour, or go shopping at Nusa Dua with the shuttle bus available! * Children aged under four-years-old must be accompanied by a parent or babysitter. Have you heard of a shopping arcade with 12 boutiques? While guys might want to get boozed at the beach club, ladies have the convenience of the on-site shops. When you’ve conquered all the shopping in Seminyak’s streets, you’ll find yourself strolling in and out of AYANA’s chic boutiques. One of the favourites is the ‘Uluwatu’ boutique which specializes in handcrafted Balinese lace. It is basically lace-everything, from clothes to home décor, and the pieces are beyond beautiful! Don’t forget to step into ‘By the Sea’, which transforms what you would usually wear only on vacation to everyday clothes. If being comfortable, simple and stylish is what you’re looking for, look no further. You will definitely go loco at the batik shop as well. Parang Kencana is known for its delicate luxury batik pieces that are simply artwork in itself. Beautifully handmade, authentic and unique, these make the best souvenirs! And how can shopping be complete without a healthy dessert? Pop by ‘I.C.E & all things nice’ for a refreshing popsicle, gelato or greek yogurt before you continue your spree! 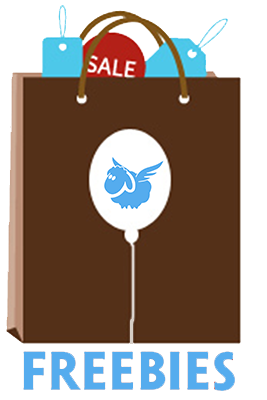 Shopping bags in one hand, ice cream cone in another while you get your manicure done at the nails salon and a fresh new look at the hairdresser’s – this is how your day at the shopping arcade will resume (with less money in the purse too). 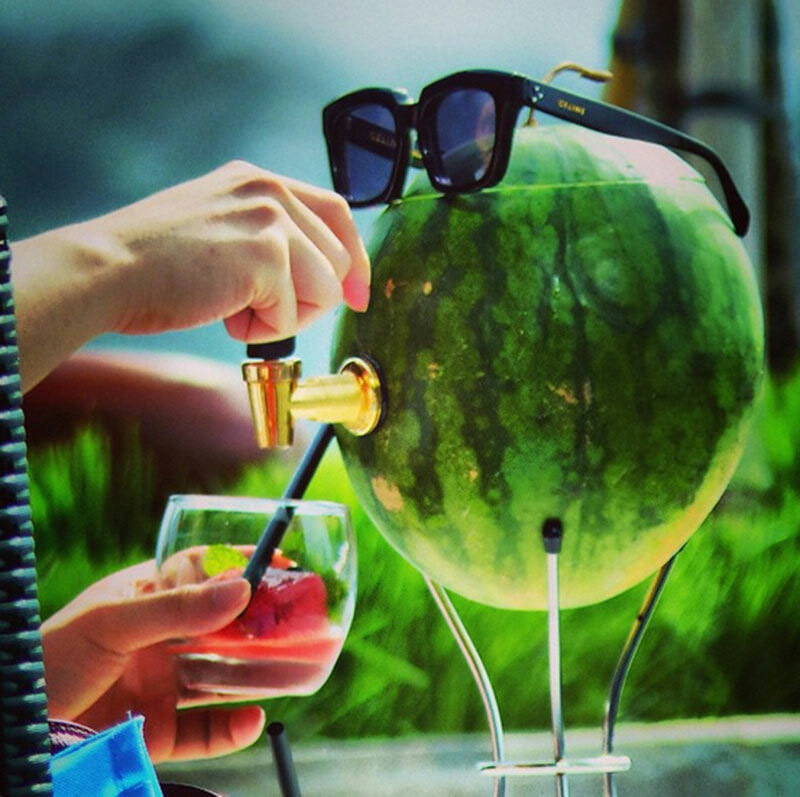 Impulse purchase alert; we repeat … IMPULSE PURCHASE ALERT! There’s far more to see, do and shop at the shopping arcade, details are as below! Now you know the secret to an incredibly romantic vacation. Trust us, a stay here will give you all the romance you need to relax, reconnect, and have the most amazing time. Feel tempted to stay here? You will always get the best prices by booking direct with AYANA! 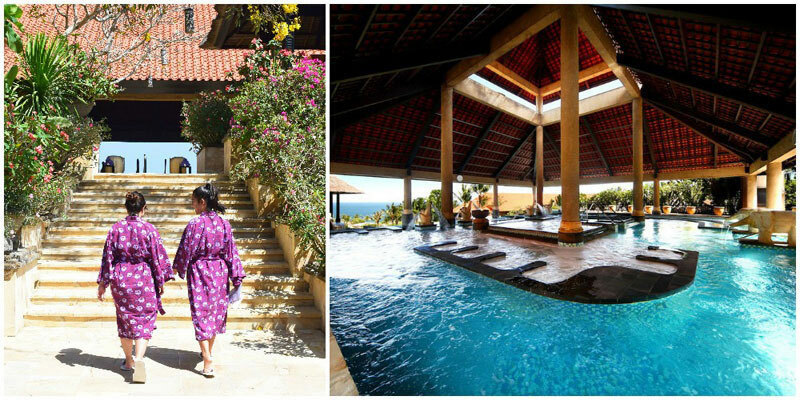 This story was made possible by AYANA Resort and Spa BALI. Comment and share with us your experiences if you planning to stay or have stayed here before and we will PM you a special offer for this hotel!